I recently had conversations with two different people who brought up Joel Osteen. One conversation was with a black guy, the other was with a white lady. I immediately take notice when two people of different gender and different race bring up the same person. They like him a lot. And what's not to like? A guy who smiles all the time and tells people nice things about themselves will certainly gain the favor of many people. And when those things are purportedly based on the Bible, then they like him even more. This observation is so obvious that John Maxwell (formerly the Senior Pastor of Skyline Wesleyan Church in San Diego) recommends "The 30-Second Rule" to achieve the effect that Osteen has mastered. Maxwell writes, "When most people meet others, they search for ways to make themselves look good. The key to the 30-Second Rule is reversing this practice. When you make contact with people, instead of focusing on yourself, search for ways to make them look good....All people feel better and do better when you give them attention, affirmation, and appreciation" (25 Ways to Win with People, 13). Interestingly, though their core messages are approximately the same ("keep on keepin' on," "stay positive," "say 'no' to negativity"), Maxwell has escaped the anathemas doled out by many evangelical Christians, while Osteen has become an evangelical whipping boy. Among some who consider themselves to be doctrinally sound, to invoke the name of Osteen is almost on par with using profanity. For others, he is the punchline for all sorts of jokes about broad smiles and white teeth. I've heard plenty of talk about how far Osteen's theology is from that of orthodox Christianity, but I have seldom heard any examples given other than the broad brush stroke that paints him in with other "Prosperity Gospel" and "Word-Faith" preachers (Jentezen Franklin, Kenneth Copeland, Creflo Dollar, Joyce Meyer, etc.). But that's a charge that he denies. Frankly, I often disagree with the way Osteen uses Scripture. For instance, in his book It's Your Time, he writes, "When your path seems darkest and you feel lost and defeated, dare to make a declaration of faith just like Jesus: 'It is finished.' What you're really saying is, 'God, I know You will turn this situation around. I know You will heal my body. I know You will restore my family. I know You will give me the breaks I need....Say it by faith" (179-180). I don't think that had (or has) anything to do with those words ("It is finished") that Jesus spoke from the cross. But I also have reservations about automatically dismissing the impact that Osteen's positive message is making in people's lives. The lady I spoke with told me, "I know his views aren't typical Baptist views, but Joel just changes the way I think. That goodness just gets inside me. I wake up in the morning and I can actually say, 'I feel better about life.'" Curiously, this lady's experience was actually deeper, more profound, and more life-transforming than what many other people experienced within their congregation during the same hour. This lady is speaking the language of repentance (changing the way you think) and fullness (goodness welling up inside you). So what do I think about Joel Osteen? I think that people generally find themselves either depressed, or arrogant, or somewhere in between. Joel's message is helpful for depressed people and those who see little dignity and worth in themselves. Those people need to be lifted up to see that they have value and potential beyond their present situation. On the other hand, arrogant people need to be humbled. But when arrogant people hear Joel's message of self-acceptance, blessing, and God's love, it can come across as a "Divine Endorsement" of their vanity - which needs no reinforcement. What arrogant people really need isn't a soft dose of comfortable moral support, but a vision and a challenge that inspires them to direct their resources toward a venture that makes a difference for someone other than themselves. Unfortunately, I just don't hear that type of preaching coming through in Joel Osteen's messages. So when I hear the people in my corner of suburbia talk about how much they "love Joel," I have to wonder if they love him because they see his smile, sense his positivity, and hear his encouragement, and take it as a sort of "Divine Endorsement" to keep pursuing personal exceptionalism by doing the things that have already made them financially secure and relationally well-connected. That, I believe, would be a mistake because, in reality, his message of optimistic hope is for those who are down-and-out, diffident, and hopeless. If we, the followers of Christ, spent our time sharing His Love and telling others how Jesus has changed us and less time criticizing anyone who is trying to do what God has called them to do, we might see more people coming to Christ. The world see's us, the followers of Christ, and say ' no thanks' because all we do is criticize and judge each other. Jesus says no one can call me Lord and not have the Holy Spirit in him. 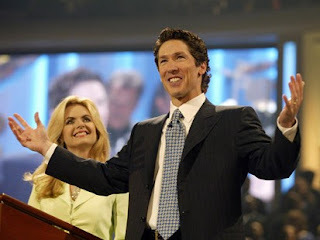 Joel Osteen is only speaking from his heart to encourage others to reach to God for help. Trust in Him to guide them and Trust in His Truth. Maybe if we tried focusing on our own walk with Christ and stop giving Satan victories by fighting with one another, maybe more people might see who Jesus really is, Savior of the world. Giver of life and oh yes, abundant living!! !